Turramurra Learn to Swim offers classes which cater for babies, preschool, primary aged children and adults. Classes start with Water Baby classes and once children are old enough and swimming independently of their parent/teacher they move into a Beginner class. As children improve, we also include instruction in overarm, backstroke, breaststroke and butterfly. Attention is given to helping students gain their confidence, teaching them how to manage their breathing and develop their style. Water safety is a focus of all classes during the Term and Holiday classes. At the end of Terms 2 and 4 each year these skills are also reinforced during our Water Safety Week. The School is divided into 7 levels of Learn-to-Swim classes in addition to the Adult Learn-to-Swim program. A child will progress through each level by achieving specific skills. Children are continually assessed to ensure that they are attending the most appropriate class for their level. Parents are welcome to discuss the progress of their child with the swimming instructor or receptionist. Certificates are awarded at the end of Terms 1 and 3 in order to encourage swimming progress and development. The most important reward is the child’s own confidence and love of the water and coming to swimming lessons. Water Baby classes are a fun introduction to swimming for babies/toddlers with their parent/carer. Parents are instructed in how to hold their children and teach them to swim to the wall using beginner dogpaddle. Class activities include blowing bubbles, splashing feet, scooping arms under the water, back float and climbing out of the pool safely. Rubber floating mats and toys are used in conjunction with class activities to build confidence and water skills. Parents are encouraged to continue this teaching process with their babies throughout the week. 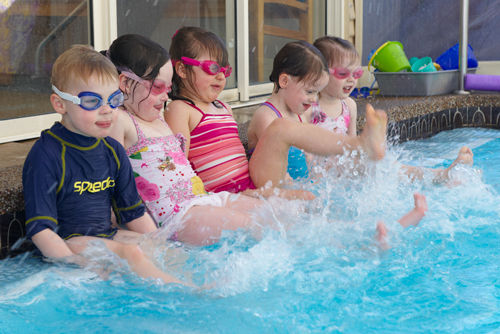 We have had considerable success with teaching children under 2 years to swim unaided and to be able to ‘recover’ after falling into the pool by turning and swimming to the side. The child’s confidence is encouraged by the structure of the class and having their parent/grandparent or trusted adult in the water with them. The beginner will start in a class that encourages young swimmers to be independent in the water by teaching them the basic ‘dogpaddle’ stroke. A back bubble is used at this level to assist with correct body position, kicking and flotation. The back bubble is used as a teaching aid to help children to develop the correct kick, allow them to be independent and for safety in the class. Children are encouraged to put their chin on the water and blow bubbles. We also teach children to swim to the side of the pool, hold on and climb out safely. This class is designed to instil water confidence and increase water safety. The three key learning areas are head position, body position and splashy kicks. Confidence in the water is also developed by encouraging children to put their face under water. This is a key part of teaching children not to panic when they fall into the pool from the side, go under the water and turn around and reach out for the wall. Control of breathing begins at this early stage with children taught to blow bubbles and overcome any reluctance to put the face in the water. Children are also introduced to floating on their back and relaxing in the water. The second stage of the Beginner teaching builds on elementary skills introduced from the first lesson and further develops and strengthens children’s kicking, paddling and head position. The layers of the back bubble are reduced and children progress to swim independently. The horizontal body position is a crucial skill developed at this stage. Putting the face and ears under water is part of swimming in a horizontal position which lays the foundation for overarm to be introduced at the next level. Back flotation is developed as a foundation for backstroke. The children are also taught to float and kick on their back. Some children are confident swimmers but take longer than others to master swimming with their face in the water and the concept of exhaling under water. Each child is continually assessed by the teacher and encouraged to progress consistent with their ability and confidence level. Children who are able to manage themselves independently in the water and have mastered the Beginner skills are introduced to the ‘overarm’ stroke. Sometimes there is a transition period at this stage where children are building up their strength and confidence dogpaddling without assistance but not yet ready to put their face in the water and commence overarm strokes and “flutter” kicks with legs straight. Children are taught to keep their bodies in a streamlined position, blow bubbles with chin on chest, kick and complete full arm rotations. The teaching methodology is a “part/whole” sequence with body position practiced doing ‘torpedoes’ and then adding “flutter” kicks” and eventually the arm action. A basic freestyle stroke is taught over a distance of 5 metres. 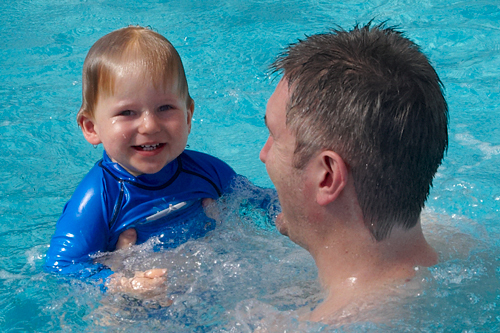 Breathing to the side on every fourth stroke is introduced as children become more confident in the water. Backstroke kicking is practised and basic backstroke swimming with alternate arm action across the pool is introduced. Attention is given to each part of the stroke with exhaling under water and ‘counting strokes’ to prepare for the inhalation phase on the side without lifting the head being one of the most important aspects of teaching this level. This class is designed for children who are competent using the overarm stroke over a 5 metre distance and are ready to be extended. The freestyle stroke is developed over a greater distance at this level and breathing to the side, not lifting the head, exhaling under the water and maintaining the kick throughout the sequence as key aspects that are developed. Backstroke is also taught building on floating, kicking and basic arm action skills developed in previous levels. Water safety continues to be a fundamental priority at this level with safe water entry and exit skills being consistently emphasised. The main aim is to have children swimming with excellent technique, a relaxed breathing sequence that does not require the child to lift the head or stop to breathe and an overarm (front crawl) that is efficient and allows the child to swim on top of the water with good biomechanics. Freestyle and backstroke skills are improved, along with breaststroke and butterfly being introduced. This class continues to work on the coordination and timing of freestyle, especially the breathing sequence and experimenting with 2, 4 and 6 beat kicking. Backstroke is also developed with the emphasis on good body position, alternate arm action efficiently “sculling” the water, emphasising body position and the need for a strong kick. The breast stroke and butterfly kicks are established with the aid of kickboards and other drills and the arm action for each stroke is taught. Life-saving skills are introduced as part of the water safety program. This level aims to refine the freestyle and backstroke technique over distances of 20-40 metres. This will increase the children’s stamina and improve technique with an emphasis on the strength of the stroke using good biomechanics, rotation of the upper body and accelerated kicking patterns. Information helpful to children competing at school swimming carnivals is also provided with starts and finishes discussed and basic practice introduced in Term 1. The butterfly and breaststroke is refined at this level with emphasis on the “timing” of the breathing and the coordination of the kick and arm action. Stroke correction is the key focus of this level. The skills required for freestyle, backstroke, breaststroke and butterfly are refined and developed. Breathing, body position, kicking and arm rotations are continually emphasised in order to increase competency and swimming technique. Children are encouraged to swim greater distances in order to increase strength and stamina which are core components of this class. Understanding how to increase speed and racing technique is part of the tuition process. The Adult Learn to Swim Program offers a safe and caring environment to teach adults who can swim but are not confident or have trouble with breathing in freestyle or have never been taught to swim properly and want to learn good technique. The classes are also designed for adults who can’t swim. The shallow water, warm temperature and the configuration of the pool provide a unique learning environment for adults to learn. The lessons are able to be structured around individual needs and adults who are fearful or have never swum before are able to progress at the rate that is best suited to them. As the pool is heated to between 32 to 34 deg. C the pool is not suitable for those adults wanting to swim laps for fitness. However, adults competing in triathlons and swimming for fitness have often enrolled in lessons to improve their technique and to develop an understanding of how to swim efficiently.